When your compact loader isn’t running, you aren’t productive or profitable. Bobcat® skid-steer loaders and compact track loaders are ready to work — with features and systems you can’t find anywhere else. Here are 10 reasons why you can rely on Bobcat machines to ensure most of your time is spent on the job and not in a shop. The optional deluxe instrumentation panel provides additional equipment monitoring, theft prevention and other advanced capabilities. 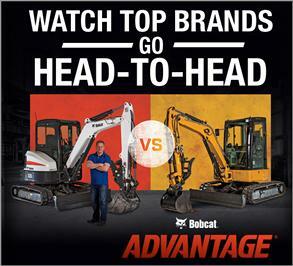 In addition to giving you more uptime, this Bobcat option provides peace of mind. Keyless start security system: Lock the panel at the end of the day and use up to eight customizable security codes to unlock and start the machine. It adds protection and you avoid any more lost keys. Attachment operation: The deluxe panel option shows operators which fingertip auxiliary controls to use for the attachment. Multi-language capabilities: Display machine functions, attachment information, troubleshooting messages and warnings in seven languages including Spanish, English and French. Function lockouts: Lock out certain machine functions to prevent misuse or damage. For example, you may choose to lock out high-flow auxiliary hydraulics so operators do not accidentally activate this function with a non-high-flow attachment. Other features: Digital time clock, resettable hour meter, attachment controls help menu and multiple password settings. 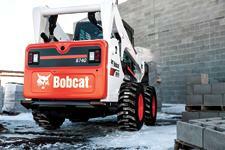 The Bobcat loader’s smart cooling system provides quieter operation, reduced maintenance and longer durability. Quiet operation: The Bobcat SmartFAN senses the machine temperature and turns only as fast as needed, reducing noise levels by up to 30 percent over other cooling fans. The quieter operation makes it easier to communicate with co-workers outside the machine. The SmartFAN also uses less power and offers better cooling in extreme conditions without overheating. More efficient cooling: The exclusive Bobcat loader dual-path cooling system brings clean, cool air from above, though the engine and hydraulic coolers, mixes it with engine compartment air, then exhausts it out two side vents. 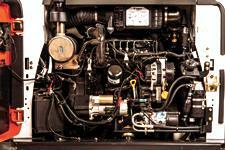 The system keeps hot air away from the operator while providing efficient cooling and cleaner engine components. Protected cooling location: The radiator and hydraulic oil cooler are well-protected between the frame uprights. In addition, the hot radiator doesn’t interfere with the engine oil drain, oil fill, oil filter, air cleaner, battery and other routine maintenance areas. On other loaders, the radiator and oil cooler are inside the tailgate — which makes them vulnerable to damage from rebar, sticks and other debris. Optional reversing fan: Developed for dusty and light-material applications, the optional reversing fan gives you the ability to keep the radiator area cleaner for longer. 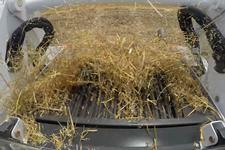 In auto or manual mode, the system will reverse and remove dust and debris from the rear screen. It extends productivity and uptime by reducing the immediate need to clean debris by hand. 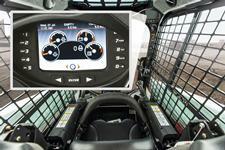 Onboard diagnostics on Bobcat compact loaders monitor more than a dozen vital machine functions. The system efficiently troubleshoots problems in the field or prevents them before they occur. Downloadable machine performance history reduces the time needed to identify potential problems. 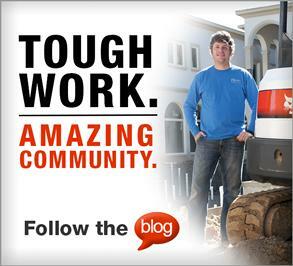 The added axle strength and size of Bobcat skid-steer loaders handle the most rugged conditions. Protected seals and heat-treated axles improve durability. Drive motors and hydraulic hoses on compact track loaders, are solid-mounted within the track system. Hoses are better protected from snags, vibrations and rubbing during operation. Bobcat drive motor hoses are intentionally hidden so they’re not exposed to normal debris, such as mud and sticks that are kicked up during operation. Better protection of these hoses means more uptime for you. Machine shutdown protection in Bobcat compact loaders monitors vital machine functions, such as engine coolant temperature, oil pressure and hydraulic oil temperature. If a monitored function is out of normal operating range, the system provides an audible alert and warning message. If the issue is severe, the system will shut down the machine to avoid catastrophic failure. 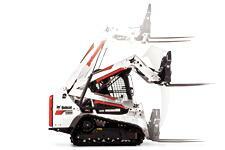 Machine shutdown protection is standard on all Bobcat skid-steer loaders and compact track loaders. Bobcat skid-steer loaders feature a keel-shaped undercarriage that navigates soft conditions and passes over obstructions. The design provides higher ground clearance and sheds debris to the outside, just as a V-shaped boat slices through water. Fewer catch points for stumps, branches, and other debris due to a smooth machine bottom. Higher ground clearance on the bottom and center of the machine where it’s most important to clear curbs and other obstacles without contacting them. 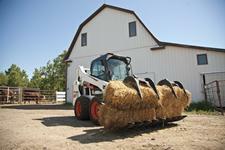 The rugged Bobcat chaincase is the only maintenance-free option in the industry for skid-steer loaders. 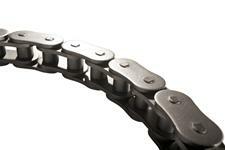 The drive chains (120 high strength chain or HSC) are 38 percent stronger to minimize the risk of breaking. While some manufacturers limit transferable horsepower to protect their smaller drive chains, Bobcat puts more horsepower in the drive chains. The exclusive fixed-axle tubes, stronger axles and fully sealed bearings save you time and money. Stay out of the shop and spend more time on the job. 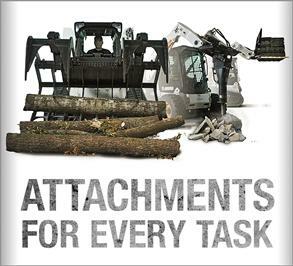 bcat loaders’ unique, patented lift-arm design is more durable. The lift arms keep every pin at each pivot point in the same plane. In addition, the pins are supported on both sides instead of only one side (cantilever design) in other machines. As a result, Bobcat loader lift arms have less lateral deflection (side-to-side lift arm movement) and reduced load on the pins themselves. Hoses are routed through the loader arms and frame uprights to minimize potential snag points. 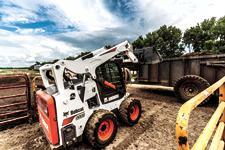 With two lift-path choices, Bobcat compact loaders have you covered — whether you need more reach at full lift height or maximum reach at truck bed height.